Having selected ten prisoners to die in the starvation bunker to serve as a lesson for an escaped prisoner, Nazi SS Captain Karl Fritsch was about to leave Auschwitz concentration camp’s Block 13 when the unimaginable happened. Prisoner 16670 stepped out of formation. A murmur spread through the line of prisoners. The prisoner, Father Maximilian Kolbe, OFM Conv., removed his cap and said, “I want to die in the place of one of these men.” “Why?” came the terse inquiry. The camp secretary crossed out 5659 (Sgt. Gajowniczek’s number) and wrote down 16670. To offer one’s own life ranks atop the most generous of human acts. Saint Maximilian asked to die a slow and hope-crushing death not only to save the life of one man, but above all to provide spiritual aid to the nine other condemned men. This, however, was the pinnacle of a life of heroic sanctity, one entirely dedicated to the Immaculate Virgin Mary. Born in 1894, Raymond Kolbe (as he was called before taking the religious name Maximilian) was born in a Poland divided between Austria, Germany and Russia. He was a lively, intelligent and mischievous child. On one occasion, young Raymond got into big trouble. He wanted his own pet bird, so he secretly, without his parents’ permission, bought an egg and tried to incubate it in his neighbor’s chicken coop. The Kolbe family was poor, and unauthorized expenses were not tolerated. So the spanking was very severe, but what most affected Raymond were his mother’s words: “Tell me, my son, what is ever going to become of you?” These words from his good mother impressed the 10-year old deeply. He became very serious and began spending more time in prayer before a little altar to Our Lady of Czestochowa the family kept in their modest home. He also began spending his free time at church. One day while praying in church asking Our Lady to show him what would happen to him, Our Lady appeared. She held a crown in each hand, one white and the other red. The white one symbolized a life of chastity and the red one meant he would die a martyr’s death. Our Lady asked him which one he wanted. To which he responded, “I would like both of them.” Our Lady smiled and disappeared. The devil, foreseeing what a great enemy he would have in this young man, did all he could to derail his vocation. The day before he was to be professed as a novice, Raymond was plagued with doubts about his vocation. He felt he was not worthy to be a religious and thought his talents were more suited for the military. He had vowed to fight for Our Lady and now he was in doubt on which battlefield (the spiritual or the physical) she wanted him to fight. At this time, Poland was not a free country—Protestant Germans and schismatic Russians dominated large parts of it. No doubt, Raymond desired the freedom of his country. And what about that red crown Our Lady had shown him? How would he become a martyr in a monastery? He was so convinced he should join the military, that he even convinced his older brother Francis, a novice with him. They were about to knock on the superior’s door to inform him of their decision when the doorbell rang. It was their mother Mrs. Maria Kolbe. Raymond was taken aback by the timing of her visit. The words they exchanged helped Raymond clear his doubts. Our Lady, in the person of Mrs. Kolbe, had intervened. She wanted him in the front lines of the eternal, spiritual war. Thus he entered the Franciscan order and took the religious name Maximilian. Recognizing Friar Maximilian’s intellectual talents, the Franciscans chose him to study philosophy and theology in Rome. In 1915, he received his degree in philosophy from the Pontifical Gregorian University. In 1918, at the age of 25, he was ordained a priest. One year later, he received his doctorate in theology from the International Seraphic College. 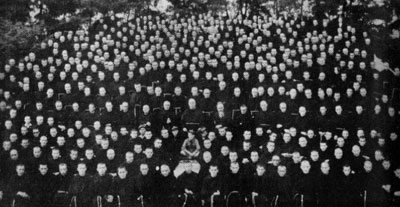 A group photo of the 700 friars who joined Saint Maximilian at Niepokalanow, the City of the Immaculate. Sometime before his ordination, the 23-year-old friar founded the Militiae Immaculatae, which translates to Knights of the Immaculate on October 16, 1917, three days after Our Lady performed the miracle of the sun in Fatima, Portugal. After Father Maximilian received his doctorate in theology in 1919, he returned to Poland and was assigned to teach in a seminary in Krakow. However, he suffered from tuberculosis which weakened him so much he could not speak loud enough to be heard by his students. His physical movements were extremely slow and everyone made fun of him. He was called the “dreamer” because he spoke of grand plans of conquering nations for Our Lady. Yet, behind all the wheezing in his lungs and the slowness of his step was a soul on fire for the glory of Our Lady, and she was testing his fidelity and perseverance. Father Maximilian was not a shy person, but had great difficulty begging for money. His superiors had warned him that he needed to beg for the money to publish his magazine because the friary would not continue paying for its expenses. So he went to a print shop to ask for a donation of paper. He entered, pretended to be looking at some pencils, bought a couple of them and left without having asked for anything! Meanwhile, the Polish currency was devaluating so fast that the money he collected for the second issue was almost worthless. His fellow Franciscans criticized him for taking on more than he could handle. Frustrated, he went to the altar of Our Lady to beg her for the money he needed to do her work. Low and behold, when he looked up, he saw an envelope on the altar. On the envelope was written “For Thee, my Immaculate Mother.” Inside was exactly the amount of money he needed. His superiors were so impressed that they let him use the money for the magazine. The Knight of the Immaculata was a hard-hitting and profoundly Catholic magazine. Not content to give his readers only positive stories and meditations, he used the magazine to guard the Catholic faithful from ideological dangers and heresies, lurking like wolves ready to eat souls. 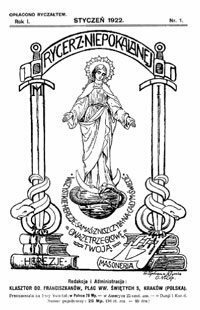 From an ambitious 5,000 copies for each of the first two editions of the Knight of the Immaculata magazine in 1922, it grew to a circulation of 800,000 copies by 1938, a number that is enviable even by today’s standards. And this does not count the several other smaller publications Father Maximilian started for children, youth and for the working class. Demonstrating the root cause of the fruitfulness of his apostolic work, Father Maximilian would assemble all 327 production and editorial staff members of the Knight of the Immaculata magazine and spend one entire night in prayer before the Blessed Sacrament and to Our Lady the day before the presses began rolling. They were crusaders doing their vigil of arms before battle. The devil and his agents were not happy with this Franciscan priest and his highly influential magazine. The influence and prestige of his publications was so great that they rivaled and surpassed secular publications. Anti-clerical liberals controlled much of the secular press, including the newsstands and the paper factories. With the exception of the first few issues, Father Maximilian wisely printed his publications using his own presses, even though they were very old. That way, the anti-clericals could not shut him down easily. So they arranged for no supplier to sell paper to him. With no paper, there could be no publications. The cover of the Saint Maximilian’s magazine, The Knight of the Immaculata. “No paper in Poland? No problem,” was Father Maximilian’s reaction. By this time, his monastery, which he began to call the “City of the Immaculata,” had a railway running right up to its print shop, the base of the Knights of the Immaculata. While the anti-clericals were rubbing their hands with glee, Father Maximilian secretly rolled in a shipment of fresh paper from Russia. The anti-clericals then announced a boycott of the Knight of the Immaculata from the official newsstands. Father Maximilian, the unstoppable crusader, decided to set up his own newsstands and sold more magazines than ever before. Realizing they could not compete, the anti-clericals let his publications back on the official newsstands. Devotion to Our Lady was one of the main pillars of Father Maximilian’s spirituality. He promoted a method of devotion as profound as the method of True Devotion to Mary taught by Saint Louis de Montfort. He consecrated himself and all his work to Our Lady. One story illustrates the level of trust and confidence he had in Our Lady. His print operations and the number of friars who had signed up to help him began to bulge at the seams of the monastery at Grodno where he was first set up. Father Maximilian decided to ask a local nobleman, Prince Drucki-Lubecki, for a gift of land near Warsaw. Father Maximilian brought a little statue of Our Lady and planted it on the property as if to claim it for her. A problem came up, however. Prince Drucki-Lubecki had just one condition for the donation of the land: the Franciscans were to promise to say Masses for him in perpetuity. The Franciscan superiors refused to accept the donation with this condition. The prince was flustered by their refusal and withdrew his offer. Just as he was saying goodbye to Father Maximilian, the nobleman said, “I understand you left a statue of Our Lady on the property. What do you want me to do with it?” Father Maximilian replied, “You can leave it. It will be the monument to Our Lady who failed to keep her promise.” And he added that he would return in three days for a final answer. Shock and guilt came over the Catholic prince. He was unable to work or think straight during those three days. So when Father Maximilian returned, the prince gave him the property with no strings attached. By 1938, Father Maximilian had 700 friars involved in his Knights of the Immaculata apostolate at the new “City of the Immaculata” in Niepokalanow. He had started up seven more publications, including a daily newspaper. The total combined circulation of his eight publications was 1.2 million just in Poland. He had also started publishing in other languages, including Japanese. Twice he went to Japan and became the first Westerner to print a Japanese language publication without Japanese help. He also had plans to launch publications in Arabic and Hindi. A radio station began broadcasting from the “City of the Immaculate.” An airport was being built to provide air transport between other cities and speed up the publications’ deliveries. Father Maximilian never took credit for any of it. Just as the apostolate of the Knights of the Immaculata was reaching these heights, World War II exploded. Poland was overrun by the Germans from the west and the Russians from the east. Once again, Catholic Poland was enslaved, this time by two of the most evil satanic powers ever known to mankind: socialist Nazism and atheist Communism. The City of the Immaculate was ordered to be evacuated. Father Maximilian sent most of the 700 friars to safer friaries or to their families and remained with only fifty-five of his “knights” who had asked to stay with him. In the middle of September 1939, the Nazis deported Father Maximilian and all but two of the remaining Franciscans at Niepokalanow to Amititz concentration camp in Germany. There, the friars endured brutal treatment, cold and hunger. In November, they were transferred to Ostrzesrow concentration camp in Polish territory through the help of the new Catholic commander of Amititz. Then, as Father Maximilian predicted, they were released in December 1939. On February 17, 1941, four Nazi officials arrived at Niepokalanow and arrested Father Maximilian again, this time for good. He was interned in Pawiak Prison near Warsaw. At Pawiak, many of his followers came and offered to take his place. The Polish prison personnel did everything they could to alleviate his sufferings and tried their best to prevent him from being moved. They failed. On May 28, 1941, Father Maximilian entered one of the most notorious Nazi death camps: Auschwitz. Set up by order of Heinrich Himmler of the Gestapo and run by the SS, it was capable of gassing to death and then cremating 3,500 people a day. Father Maximilian suffered greatly there. He suffered from lung problems and came down with pneumonia. Yet, each time he saw the camp doctor, Father Maximilian recommended some other prisoner to go to the sick bay. 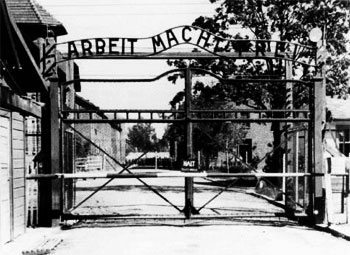 The gates of Auschwitz the words “Arbeit Macht Frei,” work will set you free. Risking his life, Father Maximilian heard confessions and preached. Twice he was able to say Mass secretly, using smuggled hosts. In a place where men were driven to despair and to extreme levels of selfishness in order to survive, Father Maximilian continually sacrificed himself for the good of others. Then came the fateful day in early August 1941, when the prisoners of Block 13 were rounded up and Captain Karl Fritsch chose nine victims for the starvation bunker. The tenth victim, Prisoner 16670, would go of his own free will. 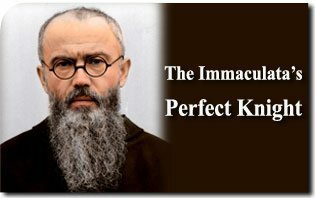 During his short life, Saint Maximilian Kolbe was a true shepherd of men, one who never hesitated to leave the ninety-nine sheep in order to find the one that was lost (Luke 15:4). Instead of cries of despair and agonizing moans, the sounds that emanated from that dark starvation chamber were those of hymns to Our Lady and the steady cadence of Hail Mary’s. Like a general who leads his soldiers from the front and refuses to leave the scene of battle until the last soldier is withdrawn, Father Maximilian remained the sole conscious man after ten days of starvation. Imitating Our Lord Jesus Christ who stretched His arms forth to accept the Cross, Saint Maximilian stretched his emaciated arm towards the executioner who injected him with carbolic acid. It was August 14, 1941, the eve of the feast of the Assumption of Our Lady into Heaven. The memory of Saint Maximilian Kolbe’s heroic death brings with it his heroic and holy life. His death was the apex of a life of epic combat, a life of a true Knight of the Immaculate Virgin. The Nazis, enemies of the Church as they were, fell into Saint Maximilian’s trap. By dying the way he did, Saint Maximilian’s life and everything he stood for was amplified well beyond what millions of newspapers or thousands of radio stations could do. Saint Maximilian, pray for us! This entry was posted in Catholic Perspective and tagged army, atheist, Auschwitz, Austria, captain, Church, city, Communism, Corrêa, Crown, crusaders, Czestochowa, Drucki-Lubecki, Father, Fatima, Freemasonry, Fritsch, Gajowniczek, Germans, Germany, Gestapo, Heinrich, heroic, Himmler, Immaculata, Immaculata's Perfect Knight, Immaculate, Imperial, Japanese, Karl, knights, Kolbe, Krakow, Lady, martyr, Mass, Maximilian, Militiae, Nazi, Niepokalanow, Oliveira, Our Lady, Plinio, Poland, Prince, prisoners, protestant, purity, Raymond, Rome, Russia, Saint Maximilian Kolbe, sanctity, TFP, War, world by Michael Gorre. Bookmark the permalink.